Now to explain a bit about the motives behind this model before I go into specific details. Counter on my youtube channel was nearing 10.000 so I wanted to make something trully special. 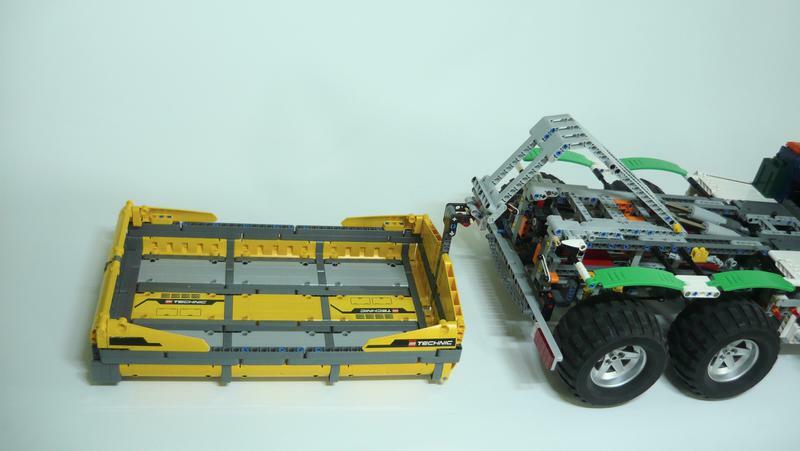 I was not sure what kind of a model I want to make, a sportscar, offroader, construction machine, so the decision came to MAKE ALL AT ONCE. 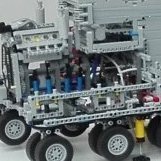 The model would also incoporate ideas from the last decade of Lego technic product to go along with my 10 years on youtube. 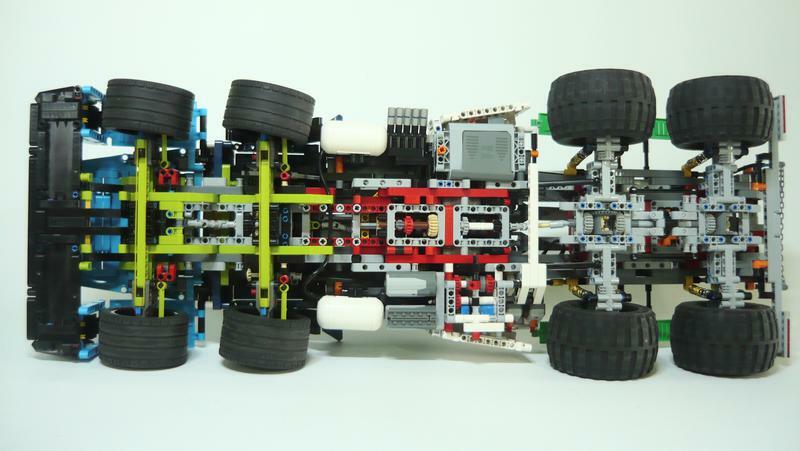 Starting with the design, the front end is heavily inspired by 42083 and 41999. 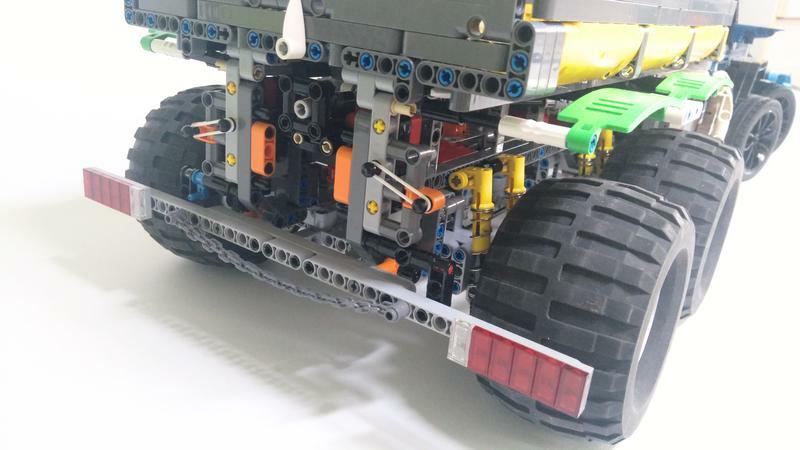 Notice the front wheels are from 42056. 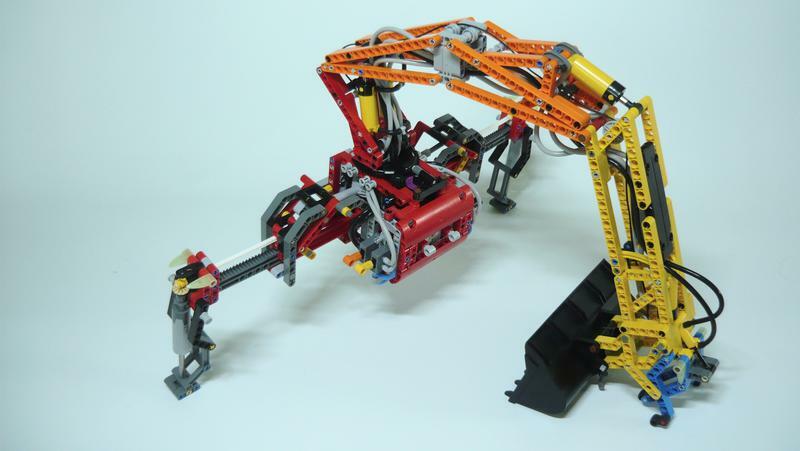 The front end can raise by 3 centiemetrs to allow the model to negotiate rough terrain. Going further back, there is a section holding the battery box and, orange lever and utensils on the left side. I will explain the function of the orange lever later. On the opposite, right side there are 2 M motors powering all the motorized functions. 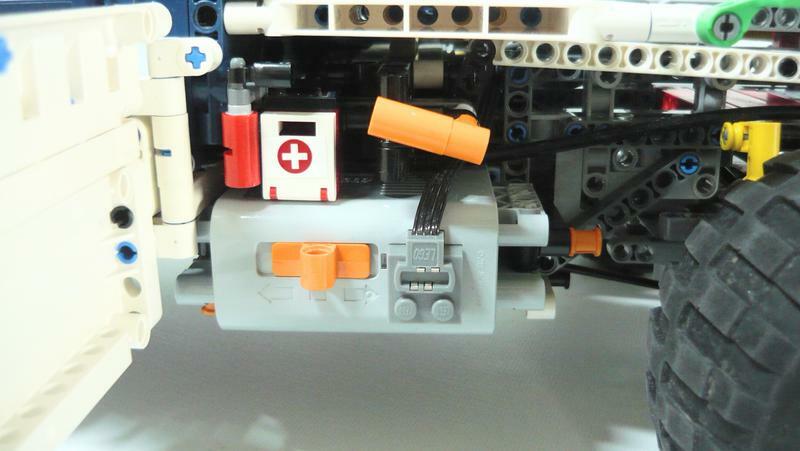 Notice the mysterious red lever which is used for switching motorized functions. Notice the pump used to power the pneumatic functions. 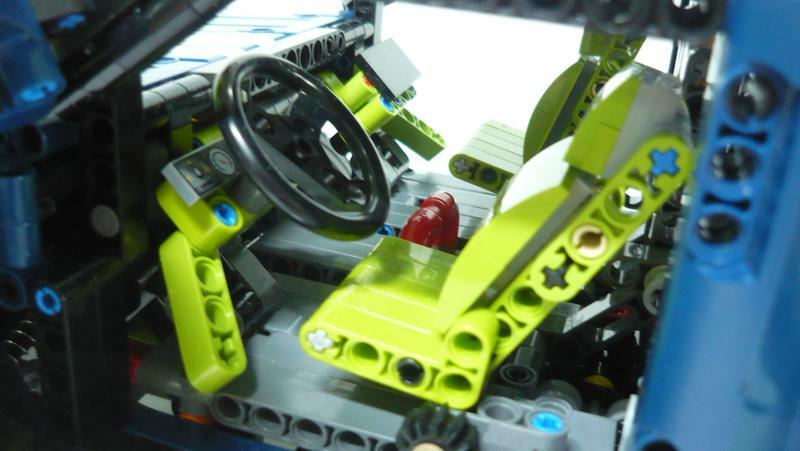 There are also two electric switches to reverse the two driving M motors. 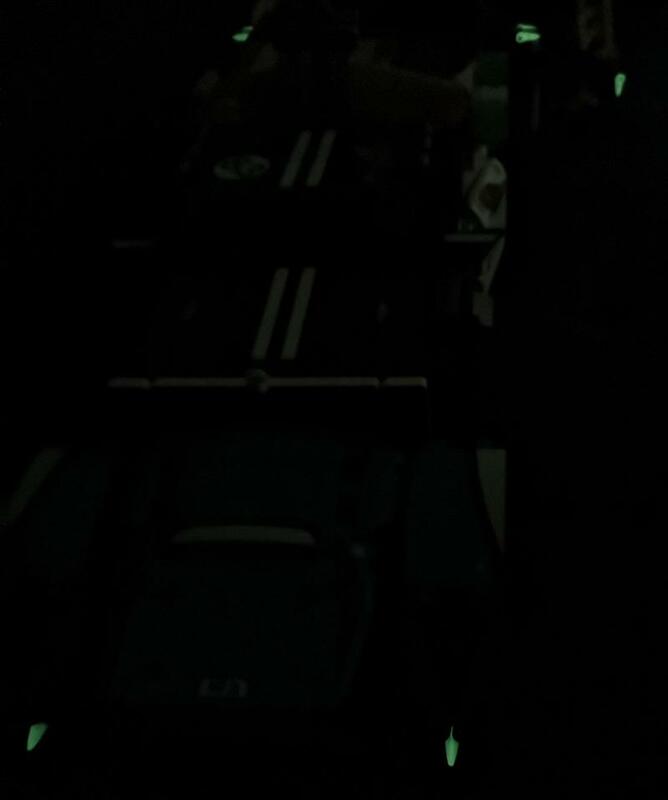 If we continue towards the back, we can see there is a pair of linear actuators used to manipulate the container. 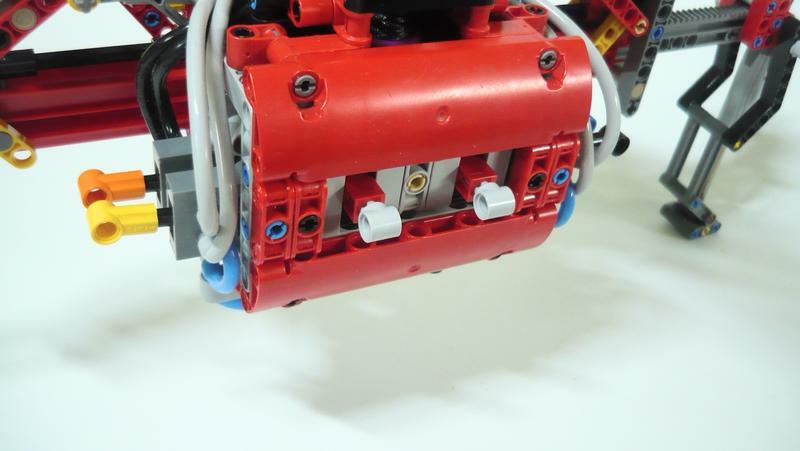 The red lever switches power from one of the M motor between the adjustable front suspension and linear actuators. But not only can the linear actuators tilt the container, but they can also pick up and load the entire thing. 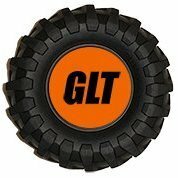 To switch between tilting or picking up, the orange lever is used to lock the individual segments of the lifting arm. This function is inspired by 8052. 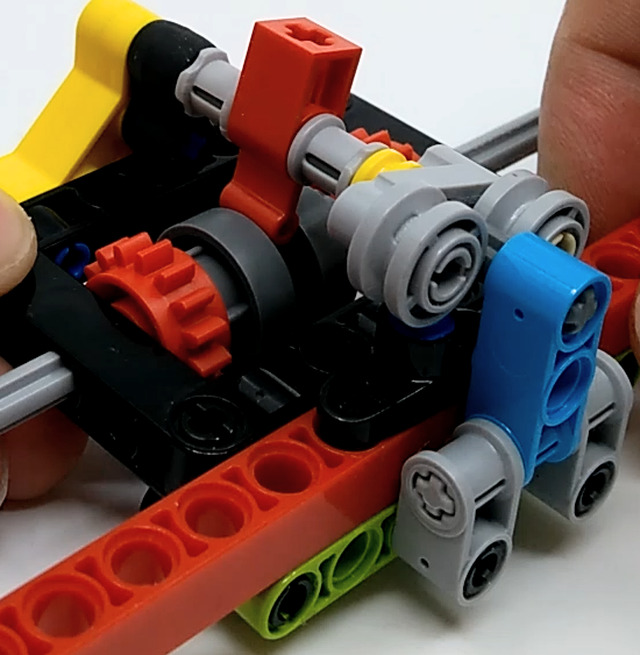 Same motor that powers adjustable front suspension, linear actuators also powers the PTO output via 24 tooth clutch gear. 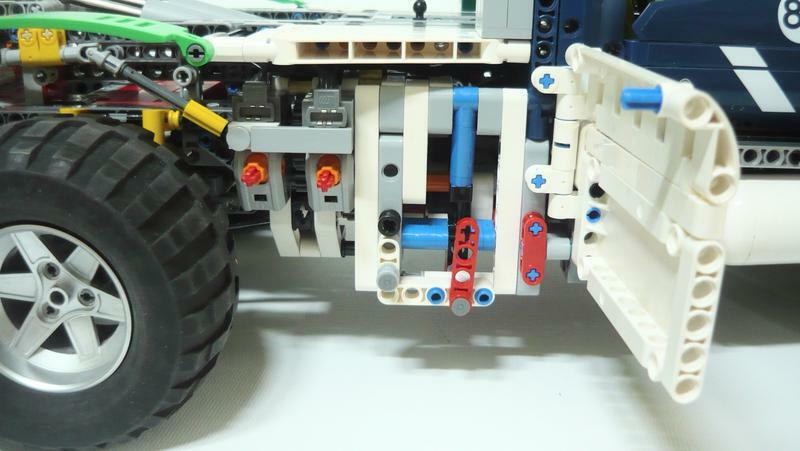 Notice that the PTO output uses a CV joint in order to slide the axles into it without friction. The rubber band mechanism is used to hold the rear attachment. 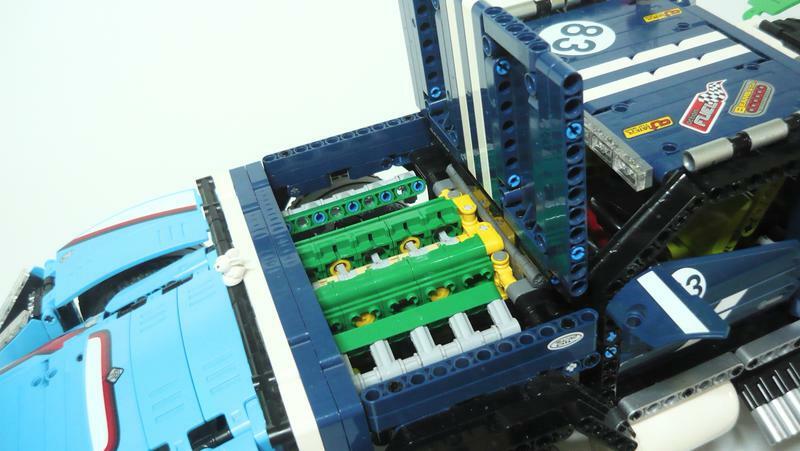 This was inspired by 8110 and 42054. I hope this photo helps you understand all the functions and features a bit better. 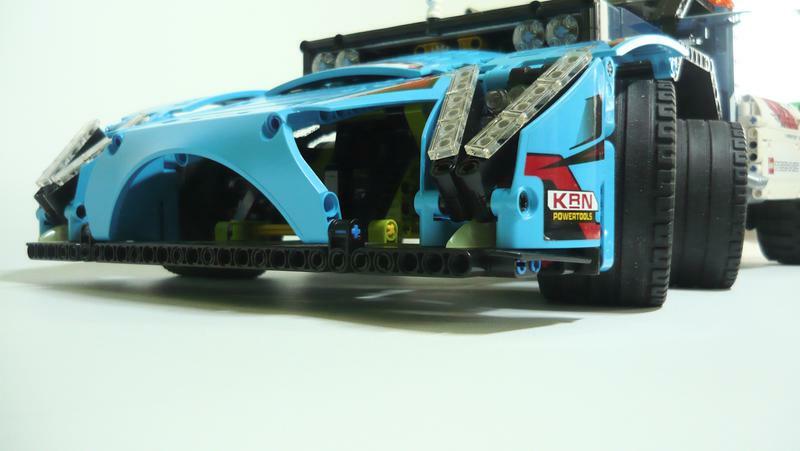 Each color of the model's chassis represents a different module. Next we will look at the rear attachment built for this model. All of the penumatic functions + rope of the winch pass through the turntable. The 4-way switchbox is one of my most complex and sense assemblies and it took me 2 days to design with support of LDD. Winch uses a friction pin to keep the rope from unloading when the winch function is off. Combining the main model with the atatchment resluts in a model which weighs around 5 kilograms and is over a meter long! 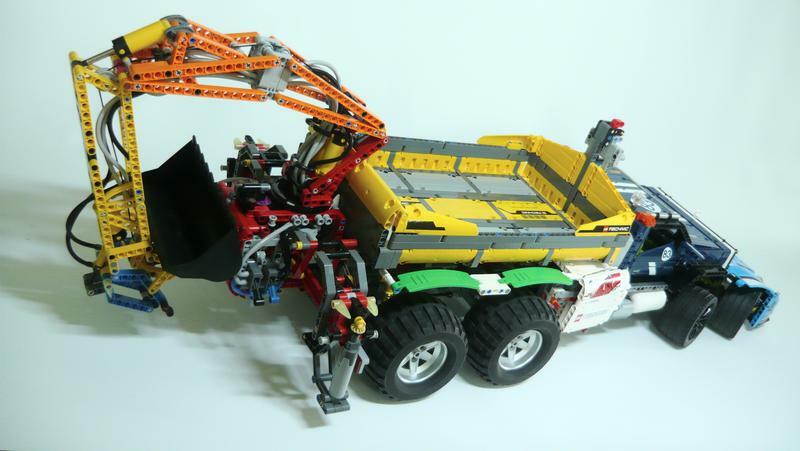 The whole model took me over 2 months to design and built, biggest challenging being the gearbox, container arm and rear attachment switchbox. A lot of care was placed into keeping all the functions working reliably with a limited power source (M motor) and safely with no gears skipping or breaking. 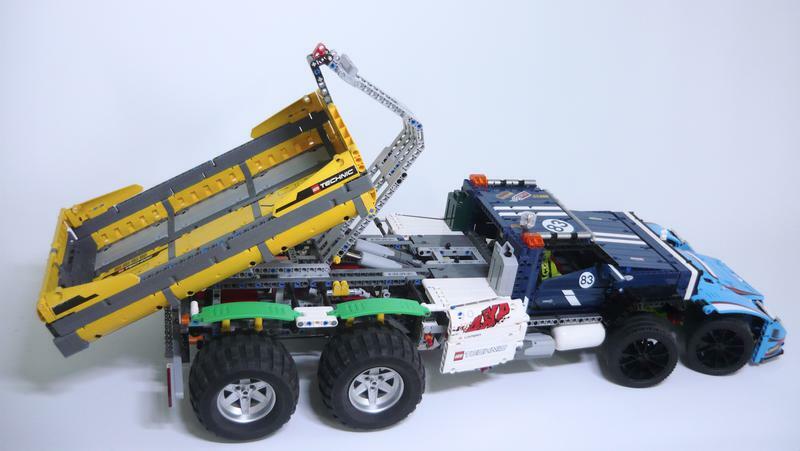 The model uses around 16 universal and 3 CV joints to transfer the power to the suspension lifting mechanism, PTO, both steering sytsems and drive axles. 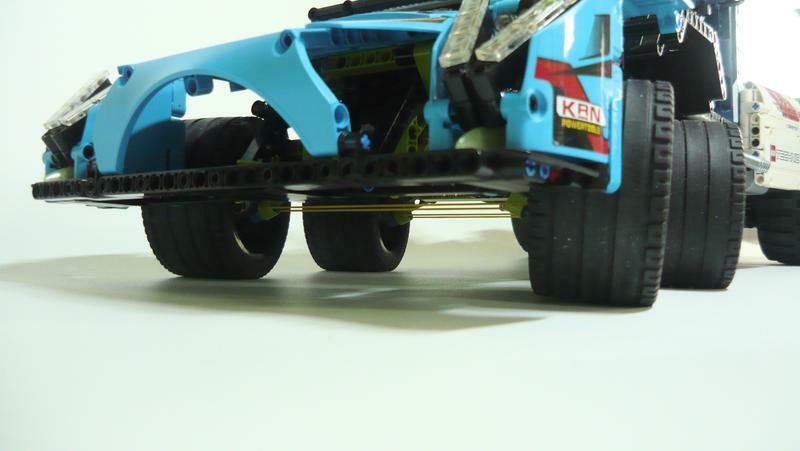 Each rear axle is capable of supporting the whole model's weight, the weak point are the Power Puller tyres which sag quite a lot, especially on the third axle. Thanks to it's stiff gearbox, this model has one of the stiffest central frames I ever built allowing the model to be easily picked up by diagonal front and rear wheel without excessive flex. This is my first model to use the white pneumatic air tanks for it's intended purpose. Finally I would like to thank you for reading through this massive post and for helping me reach 10.000 subscribers. That is one HELL of a Frankenstein build... not sure what to think of it but it's sure damn interesting and out of the box! . Congratulations on the 10.000 subs!!! "BRONZE PLAY BUTTON"
For all who don't know... getting to 10K by creating good content like this takes hundreds upon hundreds of hours of building, filming and editing! That is truly amazing. 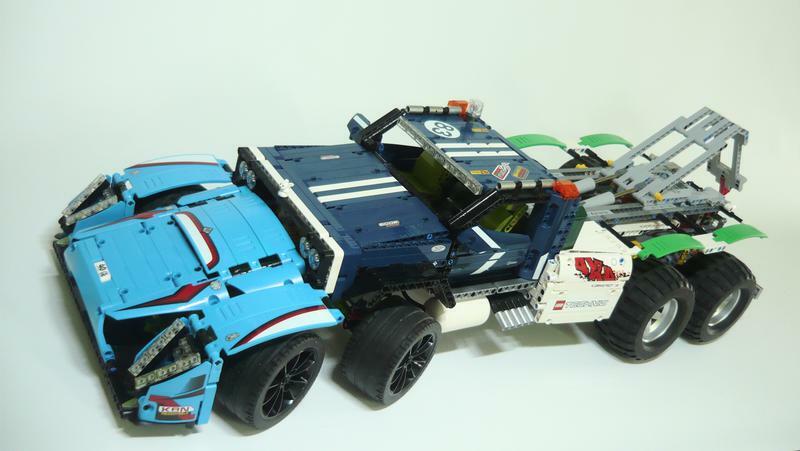 I love how seamlessly you integrated the vehicles into the final model, it's very harmonic and thus nicely done. I hope to join you at 10k some day. That is such a crazy accomplishment, so a huge CONGRATS from me! That’s an amazing build. Love how it seamlessly flows between each model. Dude, this is awesome! You actually did make all in one. 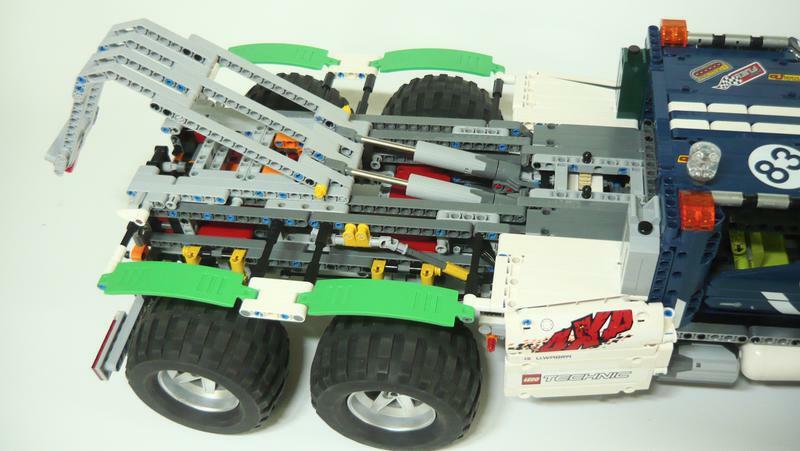 I love the idea how you decided to combine it all, and was able to build it that fast for the size that it is. It looks like it belongs in one of the Mad Max movies. I just love the 41999 cabin. The number of functions you were able to implement is astonishing. And with all the different colors it certainly is a mashup of all the different models. Great one. Love it! Like something from a Mad Max film, the colours work well. The multi function attachment is very good. I like the multiple functions ! Haha truly mashup of everything's possible! Really like it! Gratz on the 10k, way to go!